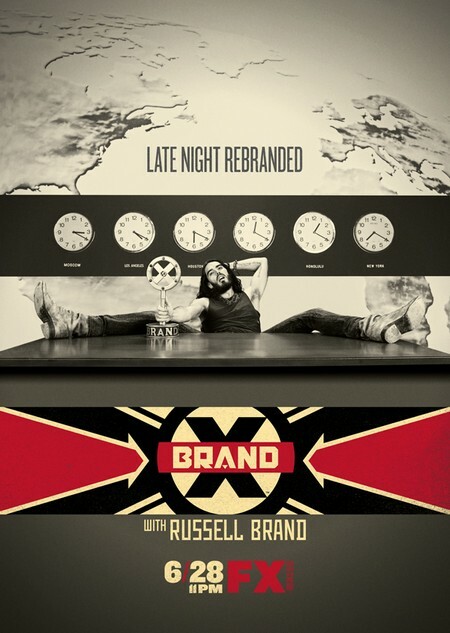 Brand X with Russell Brand features Brand’s unvarnished and unfiltered point of view on current events, worldwide politics and popular culture. Taking on the news of the day like no one else, Brand uses his unconventional sensibility, spirituality, humor and status as a recently transplanted Englishman to get to the bottom of what the news really means. The show will be driven by Brand’s interaction with a live audience as he discusses pundits, news makers and activists – many of whom he calls his friends. The premiere of Brand X is on Thursday, June 28 at 11PM E/P! The half-hour show, produced weekly from Los Angeles, will bring an unmistakably irreverent attitude to FX late night. The kind folks over at FX have provided two great gifts for one (1) of Celeb Dirty Laundry‘s lucky readers to celebrate the season 1 premiere of Brand X. HOW TO ENTER: All you have to do is comment below and tell us why you are excited to see FX’s new show Brand X starring Russell Brand. You can also gain an additional entry via twitter, by tweeting @celebdirtylaund AND @BrandXonFX and tell us why you’re excited to see FX’s new show Brand X starring Russell Brand. DEADLINE TO ENTER: Midnight June 29th, 2012 (make sure to include your e-mail address with you entry) – contests is open to U.S. Citizens.